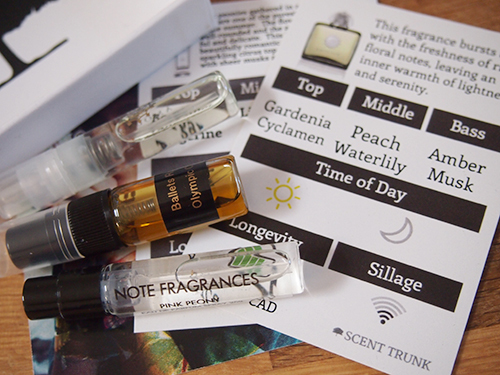 A few weeks ago I was contacted by Will, the CEO of a small Canadian start-up called Scent Trunk, to see if I'd like to try out their custom curated monthly fragrance box. I have been trying to make a habit of wearing perfume on a regular basis so I was excited to see what Will and his team have come up with. For $18 USD/month, each subscriber will receive 3 fragrance samples that have been specially selected based on a personalized scent profile (when you sign up, you fill out a survey that helps determine your likes and dislikes). Scent Trunk specializes exclusively in niche and indie fragrances so what you receive will likely be something completely new and different that you've never heard of. I love this idea because it means the likelihood of someone else on the street wearing the same scent as me is very low. In my box, I received the following three fragrances: Ballets Rouges by Olympic Orchids, Pink Peony by Note Fragrances, and Ciel Woman by Amouage. I have never heard of any of these perfume companies before but Scent Trunk includes some handy note cards to go along with each fragrance that set out full descriptions, including the various notes, what time of day is recommended for wearing, longevity, and sillage. I really like all three of the fragrance samples I received, particulary Pink Peony and Ciel Woman. They are both light and floral with a bit of freshness. Ballets Rouges is not something I would normally go for since it's a vintage-style rose perfume with oakmoss elements, but I am glad I got to try it out because I never would have otherwise. 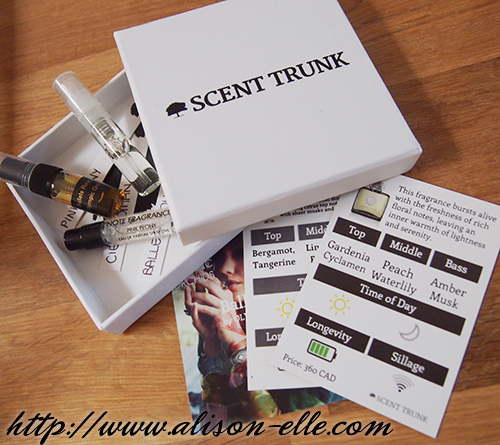 If you're a fragrance lover, Scent Trunk is a fun way to experiment and if you end up liking what you're sent, there's always the option of purchasing a full-size bottle from their online shop. Plus, once you subscribe, you'll also receive lots of interesting information on fragrance through the company's Scent School e-mails. I especially love the FAQs, which have taught me quite a few things I didn't know. For example, the "spray and walk through" method was created in 1971 by the Estée Lauder Company when they released the Super Perfume Aromatics Elixir by Clinique. That perfume had longevity and sillage ratings of 5 (out of 5), but most fragrances are much weaker. In order to avoid wasting product, it is therefore recommended to spray directly onto your "hotspots". The more you know, right? What a great way to not commit to a scent you don't love and have an entire bottle to use! Would love for you to stop by my latest post! This is such an interesting concept- I'm definitely intrigued. What a neat idea. I like the whole educational aspect of it. I doubt I'd be able to use up even sample sized perfumes that quickly, but this would a fun way to increase your fragrance collection very quickly.